I have recently received this photo from New Zealand. The player in the the back row extreme left is my grandfather Frederick Walter Phillips. 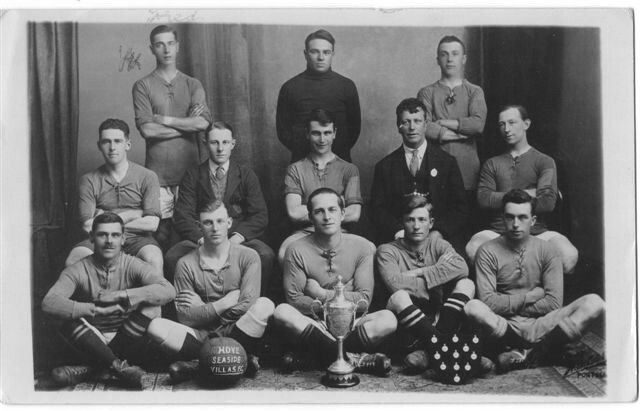 I would think that this was taken between the wars but have no other information apart from the team name visible on the football. I believe that “Seaside Villas” was the name of some dwellings near Hove Lagoon. Any information on this team and their obvious successes (by the looks of the shield) would be greatly appreciated. Is it me, or is there a remarkable facial similarity between Frederick Walter Phillips, seen here, and R. Phillips, my paternal Great Uncle, who played for Brighton & Hove Albion in the 1921 to 1922 season (see this site under “People/Sportsmen and Sportswomen/R. Phillips (Brighton & Hove Albion)? Also, are you the David Phillips who went to Portslade County School for Boys? If so we already know each other. Hove ‘Seaside Villas’ was derilect during the war and had AckAck guns on the roof. At the side there had been a flint grinding factory used in ceramics. huge rusty cogs fascinating to us kids once it was freed from barbed wire etc. Bit of a surprise to the present residents. It looks so posh now. well done.Any one remember the factory? Hi Alan, yes it is me one and the same. I agree that there is a facial similarity but I do not think that we are related. I am building my Family Tree at present and my Phillips’s come from Suffolk via London, but interesting none the less. I think that the photo is from between the wars as my grandfather (Frederick) was gassed in WW1 and his health deteriorated quite quickly by WW2. In case anybody has been looking into this, I have now found the answer. It was the 1925/26 season and they had come top of Division 4 in the Brighton and Hove Football League. Mmmm, good recovery by Granddad although he did go downhill a while later.